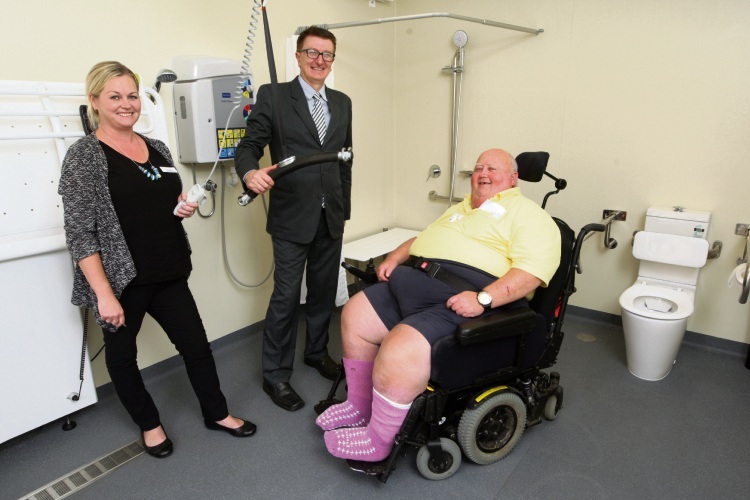 A NEW Changing Places Accessible Toilet in central Mandurah is making it easier for people with disabilities and their carers to access facilities. Changing Places, next to Mandurah Visitor Centre, was launched on Thursday and is part of an Australia-wide network of accessible toilets that have full-sized change tables and hoists that meet the needs of people with severe and profound disabilities. It is one of three in Mandurah with others at Mandurah Aquatic and Recreation Centre and Mandurah Forum. While developing Mandurah’s Access and Inclusion Plan 2015-20, it was identified that people with profound disabilities, including spina bifida, spinal injuries and motor neurone disease experienced barriers in accessing public toilets. The toilet was made possible with a $100,000 grant from the State Government’s Disability Service Commission and the WA Local Government Association. Changing Places includes a hoist, adult changing table, automatic door and plenty of space for up to three people.